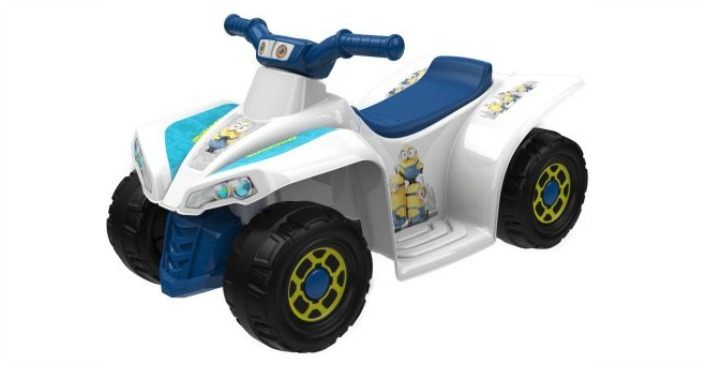 Minions 6-Volt Little Quad Electric Battery-Powered Ride-On Just $39! Down From $79! You are here: Home / Great Deals / Minions 6-Volt Little Quad Electric Battery-Powered Ride-On Just $39! Down From $79! Right now you can get this Minions 6-Volt Little Quad Electric Battery-Powered Ride-On for just $39 at Walmart! The Minions 6-Volt Little Quad Electric Battery-Powered Ride-On is a super-fun first ride for your little one. It is loaded with cute details and fun colors. This little quad features an easy-to-use push-button accelerator, and its 6-volt motor reaches a max speed of 2.5 mph. The tough ATV-style tires are durable and can tackle a wide range of terrains. A contoured seat provides that extra touch of comfort to keep your little one riding and having fun. The kid’s ride-on has an 8-hour charge time before use. It has a 40 lb weight limit, and assembly is required. This 6-volt ride-on is easy to use and makes a fun gift for little ones who want some wheels of their own. This toy is designed for children ages 18 to 36 months.